I adore spring! It’s like Christmas in March with nature offering up an abundance of gifts that quietly awaken and unfold before our eyes. From the budding trees, the blossoming flowers, the birds serenading from the treetops to longer, brighter and warmer days. Spring is green, gentle and alive. It’s the infant stage of the seasons of transition where innocence and purity resonates throughout the landscapes. It’s a season of hope and renewal that encourages months of optimistic dormancy to awaken while gently nudging the seeds of new beginnings to burst into fruition. How can you not love spring? Don’t get me wrong, I have an appreciation for each season, but spring just seems to be nature’s defibrillator, a high voltage pacemaker that miraculously jump starts life back into the land. Take time to embrace this overflowing bottle of bubbling seasonal joy and indulge in your victory over that pesky vitamin D deficiency. As we usher in the change of seasons and celebrate the warmer weather, we pay our respect to the fine stewards of the land, Montana farmers. The United Nations, led by its Food and Agriculture Organization, launched the 2016 International Year of Pulses to raise awareness about the protein power and health benefits of dried beans, peas and other pulse crops. Montana farmers have been introducing pulses into the crop rotation cycle over the last ten years as a way to improve nitrogen levels in the soil. Read along as writer Suzanne Waring explores the roll Montana producers play in the U.S. and foreign markets. Try being a female medical provider of any type during the first decade of the twentieth century. We take a look back at the life of pioneer dentist Lottie M. Conyngham and her plight to fight tooth decay in central Montana. Skip ahead to the twenty first century where 92 years young, dentist emeritus Dr. Everett Lynn, may be retired but he’s not afraid to toot his own horn… a clarinet that is. Check out the musical genius behind the licorice stick. And Gatlin Sutherland may look like an ordinary 5th grader but behind the fun-loving and polite demeanor is one of the top ranked racquetball players in the nation. Find out the little things this champ does to make big things happen! This is just a dusting off the top of this issue’s spring bounty. 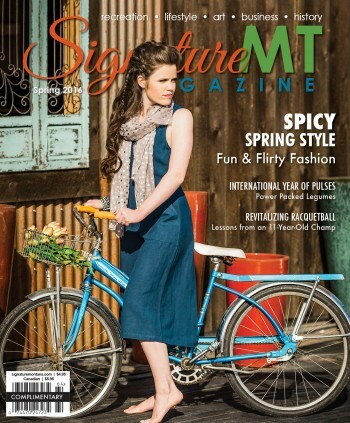 Now, enjoy that first iced coffee of the season while you peruse the pages and reap the rewards of SignatureMT’s spring edition.